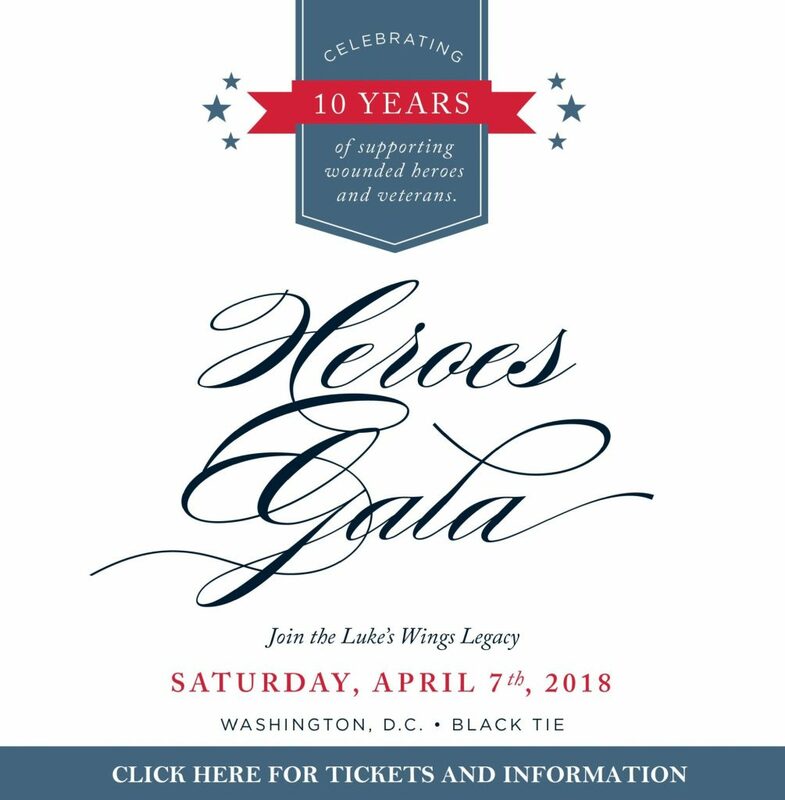 Washington, DC – On April 7th, Luke’s Wings hosted the 10th Anniversary Heroes Gala, looking back on ten years of service through the eyes of beneficiaries and donors. This year’s event, dedicated to celebrating Luke’s Wings’ spirited history, raised over $433,000 to support their mission of providing flights to wounded, ill and injured service members and their loved ones during recovery and rehabilitation. To celebrate this milestone anniversary, guests heard from ten families, one from each of their ten years of service. The program began with an emotional National Anthem performance by U.S. Army Captain Luis Avila and World War II veteran, Harmonica Pete DuPre. Avila, a Luke’s Wings beneficiary, lost his ability to speak after being severely injured by an IED explosion in 2011. While his speech is still impaired, he has developed the ability to sing through voice therapy. U.S. Marine Corps Corporal Ryan Wightman (Ret.) and U.S. Army Sergeant Zachary Herrick (Ret.) introduced the 2018 Legacy Award Recipients – five companies chosen for their unique impact on Luke’s Wings’ growth and success. Representatives from SRS Distribution, Inc., the evening’s presenting sponsor, Delta Air Lines, E-9 Corporation and Veteran Enterprise Solutions Inc., SAIC and Rumsfeld Foundation were featured on stage for special recognition of their service and commitment to the military community. Additionally, U.S. Army Staff Sergeant Robert Fierro (Ret.) and his family were welcomed to the stage with a standing ovation as they told their story of service and sacrifice while recovering at Walter Reed National Military Medical Center. His wife, Lisa, shared a touching list of moments made possible by Luke’s Wings, including keeping “Team Fierro” strong and ensuring her two young sons were still able to have a childhood amidst their father’s recovery. Since it’s founding, Luke’s Wings has expanded its mission to serve the Special Operations community as well as injured and ill service members recovering far from home. These two program lines were emphasized with guest speakers throughout the night. Director of Warrior Care at Special Operations Command, Colonel Cary C. Harbaugh, spoke to the importance of their relationship with Luke’s Wings in supporting the men and women sustaining injuries; past, present and future. Furthermore, U.S. Marine Corps Gunnery Sergeant Edward Schrank (Ret. ), a five-time head and neck cancer survivor, spoke about his heart-wrenching battle with cancer resulting from chemical exposure during his 15-year military career. His combination of truth and humor emphasized the importance of loved ones when he was at his lowest point; reminding him of the tomorrows ahead. Special appearances also included U.S. Navy veteran and musician, Dave Bray, Medal of Honor Recipient U.S. Army Captain Florent Groberg (Ret.) and viral sensation, Joe Everson, who performed God Bless America while creating a one of a kind painting of the Raising of the Flag at Iwo Jima. Check out photos by clicking here! Join Luke’s Wings for the 7th Annual Pro-Am Heroes Golf Classic, held at Bethesda Country Club, on Monday, June 25th. 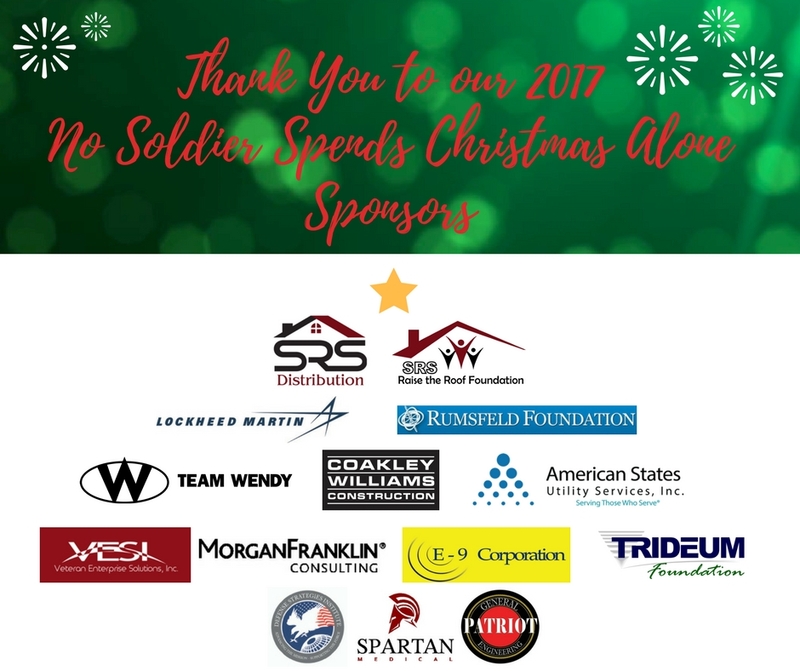 Sponsored by SRS Distribution, Inc. and SRS Raise the Roof Foundation, golfers will have the chance to interact with wounded service members and PGA Tour players while supporting the military community. More information can be found at www.lukeswings.org/heroesclassic. 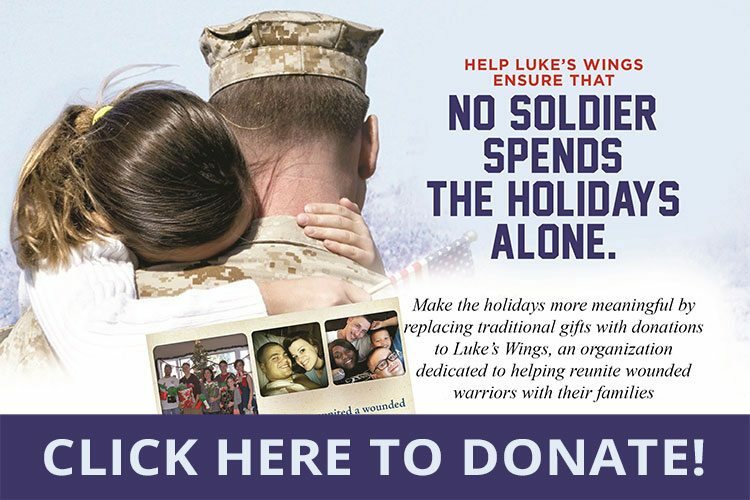 [About Luke’s Wings] Luke’s Wings is a military non-profit dedicated to the support of wounded, ill and injured service members by providing loved ones with the means to visit during recovery and rehabilitation. For more information, visit www.lukeswings.org or email development@lukeswings.org.